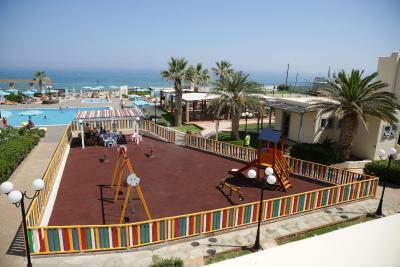 Lock in a great price for Europa Beach Hotel – rated 8.5 by recent guests! This hotel had all that we had hoped for a perfect holiday, inclusive meals with endless drinks inclusive of beer and wine, play area and kid friendly baby sitters to keep a watch, lots of activities for the kids to enjoy. Right at the gate of the hotel one can find a hop-on hop-off train which takes to the town and here you can book the boat tours to the nearest islands or shop around the town. We did go-karting, mini golf and balloon rides as well besides spending endless hours on the beach and the pool. Not t mention the evening ice-breaking theater programs which allowed us to get to know some of the fellow holidayers. We definitely plan on making a return trip !! Personel friendly and helpful, pools with sea water and normal water is very good. כפר נופש יפה ומטופח מאד, אווירה נהדרת במלון, שירות ידידותי, חייכני , מקצועי ואיכותי של כל צוות המלון. שפע של אוכל, הפעלות לילדים. המיקום מצוין - נמצא על הים, קרוב למקומות בילוי ואתרי תיירות. שלוש בריכות במלון, הכל כלול באמת, כולל אלכוהול ובירות. Шикарный натуральный песчаный пляж, на который ездит вся округа, которая не хочет купаться на искусственном песке. В будний день вам может показаться что вы одни на пляже. Пляж от отеля 30 секунд ходьбы. Это самый большой плюс отеля. Из других отелей идти сюда дольше, поэтому пляж не многолюден. Все остальное 4 звезды. Может быть кроме персонала, которые на 5 звезд. Но это на всем Крите так. Το ξενοδοχείο ήταν πολύ ωραιο και οι περοχες τελειες σε σχέση με την τιμή.το προσωπικό πάρα πολύ ευγενικό. Die Lage am Meer, das vielfältige Angebot im Hotel: 2 Pools mit je einer Poolbar, ausreichend Liegen mit Sonnenschirmen, das Wellnessangebot, das aufmerksame und sehr freundliche Personal, ein reichlich ausgestattetes Büffet. Het personeel was zeer vriendelijk en deed echt zijn best om het iedereen naar zijn zin te maken. Je kon de hele dag gratis eten en drinken pakken. Ook hebben ze 2 hele mooie zwembaden, echt een aanrader. Красивая территория, хорошие бассейны, виды из окна. This beachside hotel in Analipsi, northern Crete, has 2 swimming pools and a sun terrace with loungers and parasols. It offers a poolside bar and snack bar. Analipsi town center is about 10 minutes’ walk away. The air-conditioned rooms in Europa Hotel have a private terrace or balcony, as well as a private bathroom and satellite TV. All of the rooms have a telephone, fridge and safe deposit box. Hotel Europa has a TV room and a mini club for children. There is also a fitness room, and a free Wi-Fi zone. 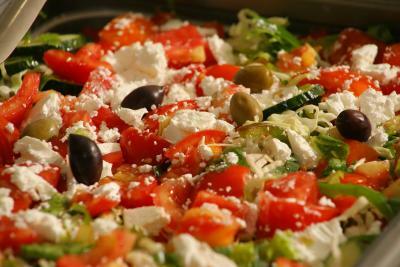 The Europa’s restaurant serves classic Cretan dishes, as well as international cuisine. There is also a bar. Analipsi is a great choice for travelers interested in relaxation, local food and sunshine. 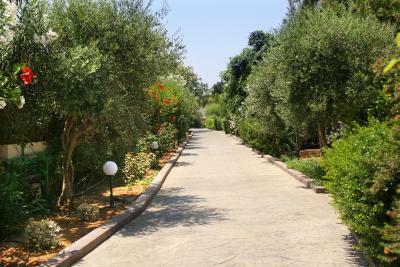 These air-conditioned rooms have a private terrace or balcony, as well as a private bathroom and satellite TV. This single room has a balcony, view and soundproofing. This double room features a balcony, air conditioning and soundproofing. Area Info – This neighborhood is a great choice for travelers interested in relaxation, local food and sunshine – Check location Great location - show map Guests loved walking around the neighborhood! Simply great hotel! The hotel is tastefully decorated and successfully combines both authenticity and modernity - what grants the place the look of a picturesque village with a pastoral, special and magical atmosphere. The resort is clean, well maintained and perfectly located - in a convenient and quiet environment, right on the beach and approximately 10 minutes walking distance from the center (where there are restaurants, shops, supermarkets, etc.). If you want to go out of the area a car or taxi is needed. 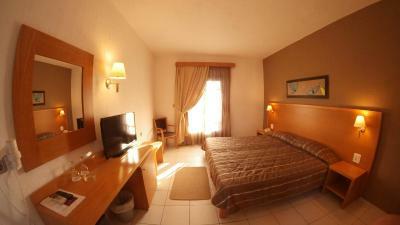 The rooms are spacious, bright, cozy, tidy, nicely decorated, air conditioned and have a lovely balcony with a pool view. All inclusive - cocktails, soft drinks, hot drinks, light meals and refreshments are served in bars during the day. The food is delicious and varied. There are different types of swimming pools (sea water and fresh water), many facilities, lots of activities, shows and entertainment for children. Mr. Giorgos Loulakakis (Reservations Department), the receptionists and staff are very friendly, courteous, attentive, with a high service awareness and willing to help with any matter at any time - and always with a smile. Highly recommended - just go and enjoy!